In celebration of Sandpiper Realty and Sandpiper Rental’s 50th Anniversary, we are making $200 donations each week throughout the year to local non-profits. 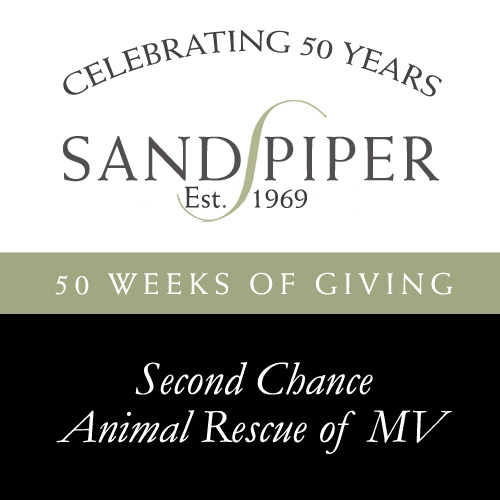 The fourth donation of our 50 Weeks of Giving initiative is going to Second Chance Animal Rescue of Martha’s Vineyard. Second Chance Animal Rescue is a cage free, no-kill rescue and shelter. They take a proactive role in bringing rescue animals from all over the country and transporting them to the island to find good homes. They provided caring homes and veterinary care, as well as assure the spaying and neutering of all rescue animals. To make a financial contribution, or to find out about volunteering around the shelter or becoming a foster, visit their website here.